In Yemen, a coalition led by Saudi Arabia and the United Arab Emirates has launched an all-out offensive against the key port city of Hudaydah. The offensive is expected to be the biggest battle in the ongoing 3-year war between the U.S.-backed, Saudi-led coalition and Houthi rebels. In Yemen, a coalition led by Saudi Arabia and the United Arab Emirates has launched an all-out offensive against the key port city of Hudaydah. The offensive is expected to be the biggest battle in the ongoing 3-year war between the U.S.-backed, Saudi-led coalition and Houthi rebels. The war has already killed 15,000 civilians, sparked the world’s worst cholera epidemic and pushed the country to the brink of famine. 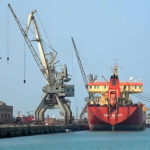 Humanitarian organizations have warned the offensive could be a catastrophe for a quarter of a million civilians living in the port city, and for the rest of the Yemen, which is highly dependent on aid that travels through this port. The Supreme Court has ruled 5 to 4 to uphold Ohio’s aggressive purging of voters from the rolls. The ruling means that states can remove people from voter rolls if they miss a few elections and then fail to respond to notices from election officials. One survey found nearly 150,000 people were removed from the voting rolls in recent years in Ohio’s three largest counties alone. Critics say the court’s decision is yet another victory for conservatives trying to restrict voting rights. Demonstrators descended on Washington Monday in the latest protest staged by the new Poor People’s Campaign, which organizers say is the most expansive wave of nonviolent direct action in the U.S. this century. Campaign organizers Reverends William Barber and Liz Theoharis and around 100 others were arrested for protesting a Supreme Court ruling that dealt a major setback to voting rights by upholding Ohio’s controversial voter purge law. At least 300 people were arrested nationwide. Nearly 2,000 people have been arrested around the country since the campaign launched, 50 years after Rev. Martin Luther King Jr. launched the first Poor People’s Campaign. Democracy Now!’s Amy Goodman and Carla Wills were in the streets of Washington, D.C., covering the action. Nine religious leaders were arrested on the steps of the Supreme Court on Monday in Washington, D.C., after participating in a national day of action for the new Poor People’s Campaign. They were handcuffed for five hours and jailed overnight in cells with cockroaches before being brought into court in ankle irons. The religious leaders were among 100 people arrested in Washington, D.C., Monday as part of the protests against poverty and racism.